Hello everyone and Happy Pi Day! 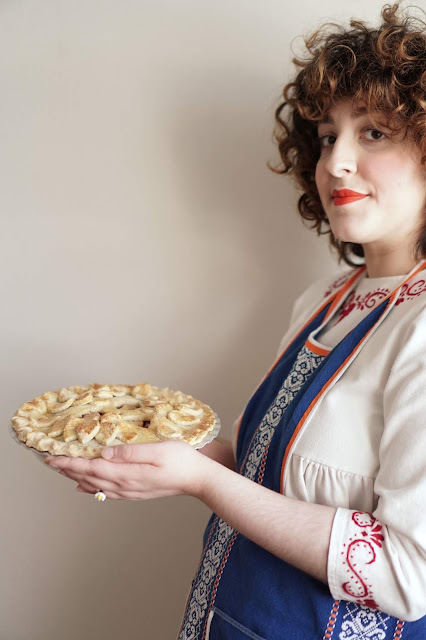 I come to you on this special day with another recipe, this time (of course) for pie! This apple pie is adapted from a recipe by the Hummingbird bakery. I personally love my apples to be a bit on the sour side, so I chose Granny Smith apples, but you could use any juicy apples. 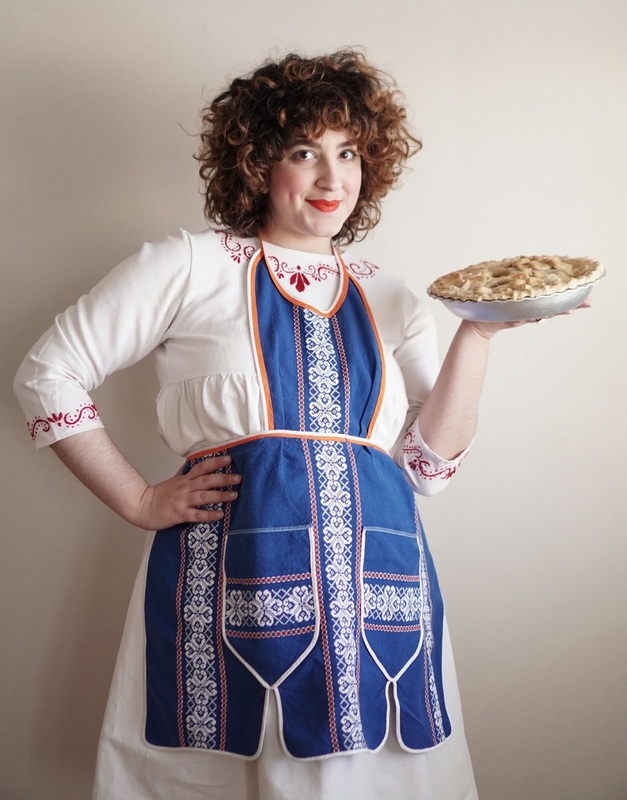 The wonderful apron and dress that I am wearing are both from Olga Valeska's Etsy shop. And my ring is from Femme De Bloom. Whisk the 220g butter with the flour, until you get a grainy consistency. Add cold water, tablespoon by tablespoon until the dough comes together. Leave to rest in clingfilm for an hour. Divide the dough into two equal parts (one part for base, and one for the pie lid). Roll out one part of the dough until half a centimeter thick and line the pie tin with it. Peel and slice the apples in fairly thick slices. Put the 150g butter and cinnamon in a saucepan and melt the butter, then add the sugar followed by the apples slices. Make sure all the apple slices are covered with the butter-cinnamon-sugar mixture and let cook for a couple of minutes until the apple slices soften a bit, but are not completely cooked. Spread the apple slices on a plate and leave to cool. 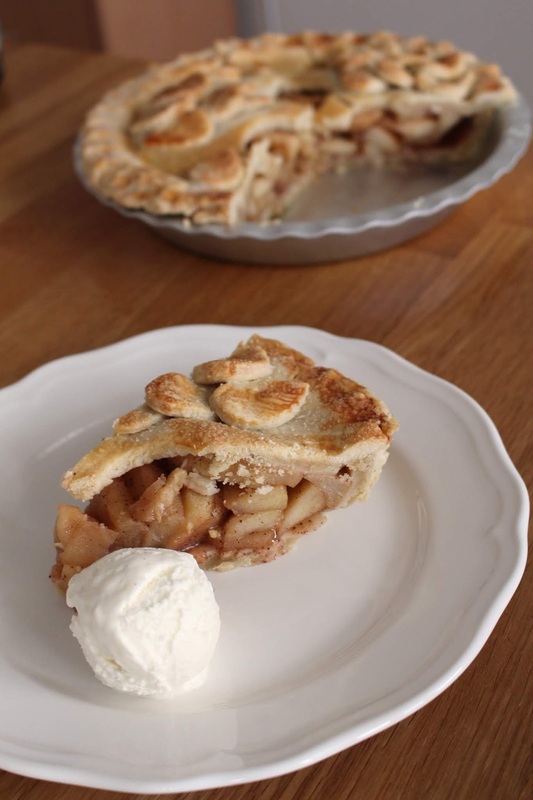 Fill the dough covered pie tin with the cool apple slices. Roll out the other part of the dough, and place it on top of the apple slices like a lid. Cut a couple of slits in the pie lid (so that the steam can leave) and add any decorations. Beat the egg and add a tablespoon of milk to it, then brush this mixture over the pie lid. Sprinkle on some sugar and bake for 30-40 minutes. So there you have it, my apple pie. 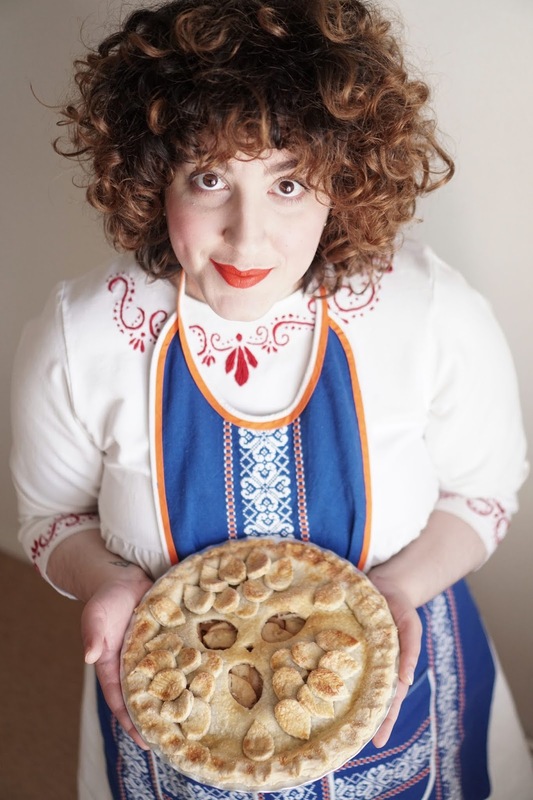 I hope you like the recipe and I hope you spend this Pi Day eating lots and lots of pie. 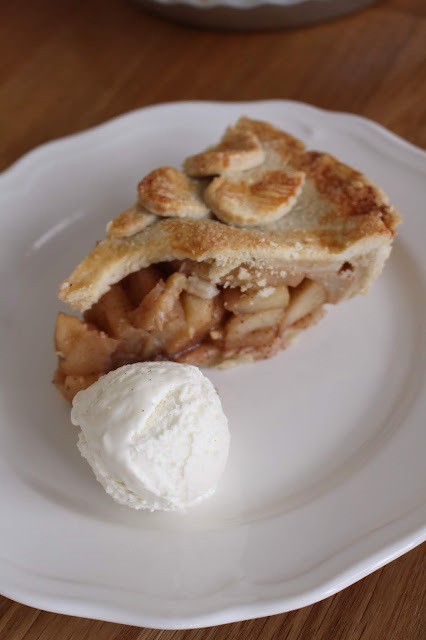 I like to eat my pie with ice cream or custard, but I prefer Pie à la mode. How do you like to eat your pie? Please tell me in the comments. 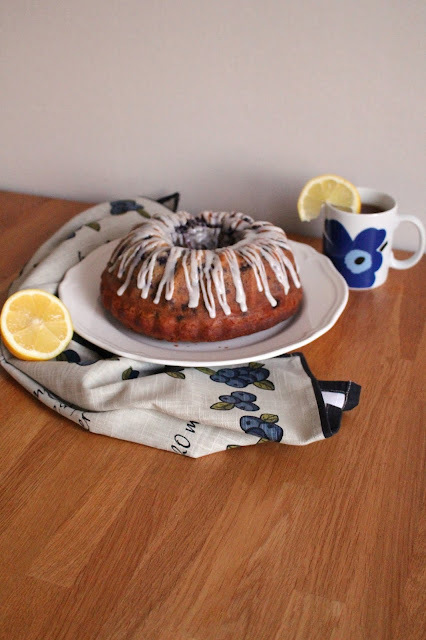 Today I have a recipe of a delicious, citrusy blueberry cake for you! But before that I need to tell you about my inspiration behind this bake. Two weeks ago was my birthday. I turned 28 years old, which I'm very happy about, because finally I left 27 behind me. The number 27 is really difficult to pronounce in Swedish - tjugosju. I'm so relieved I don't have to say I'm tjugosju years old anymore! 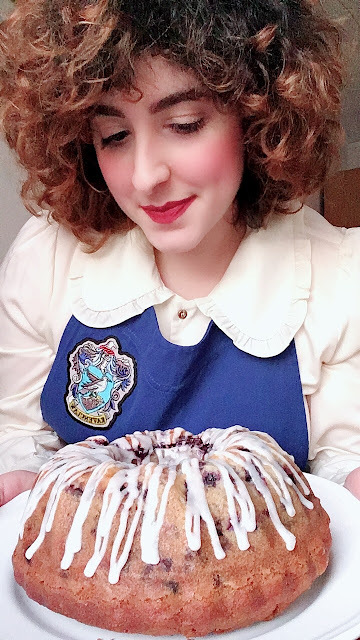 For my birthday, my dear friend Christiane (IG: @aliceinthewoodssomewhere) sent me a package filled with wonderful things, among them a beautiful Ravenclaw-styled apron that she had made herself!! 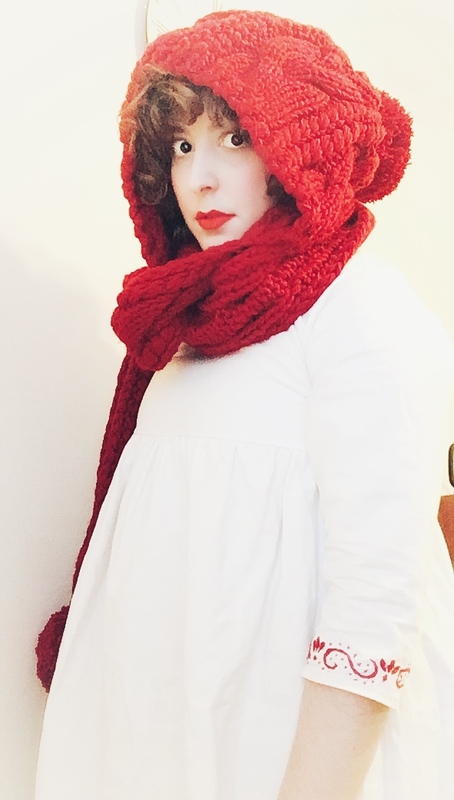 I fell in love with everything in my birthday package, but I'm a real sucker for handmade things. I imagine that I can feel the love it was made with. 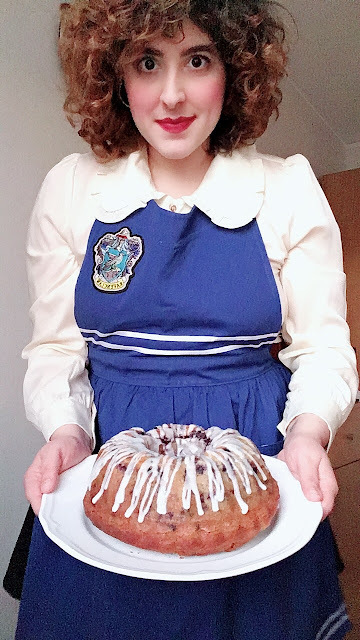 This apron, in true Ravenclaw colours brightened my life with it's bold blue colour. 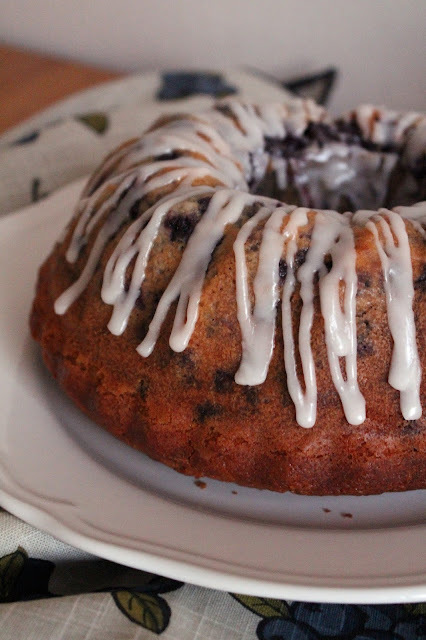 And with that I figured I need to bake something with blueberry in it. So after a little bit of experimenting, I present to you a blueberry bundt cake. Preheat your oven to 175°C. 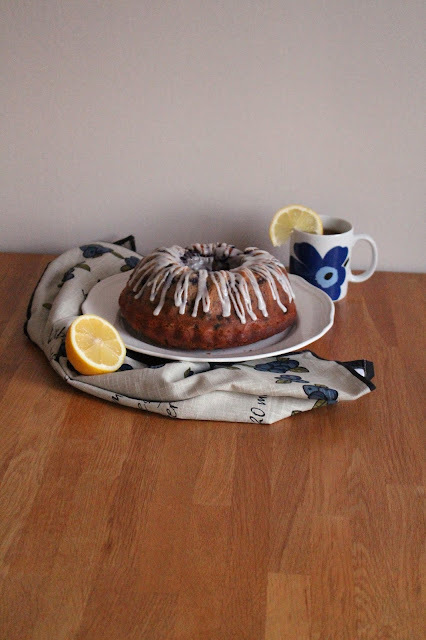 Prepare the bundt tin by buttering it, and then add flour to it so that the cake won't stick to the tin. Beat the butter and sugar until slightly fluffy. Add the eggs, one at a time. Mix the dry ingredients (flour, baking powder, lemon zest) together in a separate bowl. Mix the milk and lemon juice in another bowl. Alternate between adding the dry ingredients, then the wet, to the butter-and-sugar-mix. Start and end with the dry ingredients. Mix in the blueberries lastly. If you use frozen blueberries, like I did, they might become a bit wet, and might sink to the bottom of the batter (this happened to me). 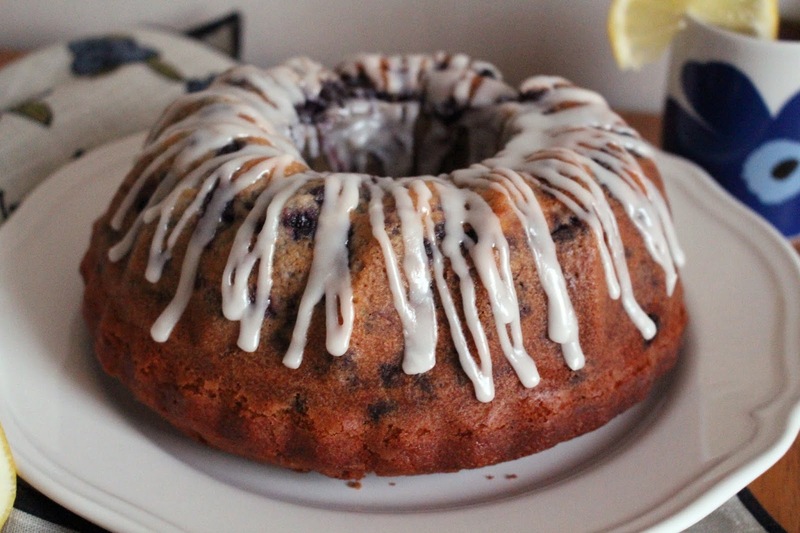 To avoid that, roll the blueberries in a bit of flour, and then add them to the batter. Bake for 40 minutes, or until a toothpick inserted in the cake comes out dry. For the icing, mix the lemon juice with the powdered sugar until it becomes thick, but pipeable. Drizzle or pipe the icing onto the cake after it's cooled. I hope you enjoy this recipe. It was a lot of fun to make it and then bake it, and finally eat it! It's been a while since I blogged and more than a year since my last Etsy Love post. I'll remind you of what it is - my Etsy Love posts are posts where I introduce you to some of my favourite shops and creators that can be found on Etsy. 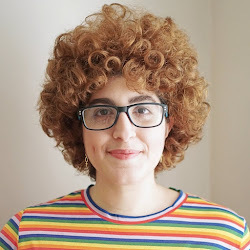 I want to introduce to you the incredibly creative illustrator, photographer, artist, seamstress, crafter and shop owner Olga Valeska. 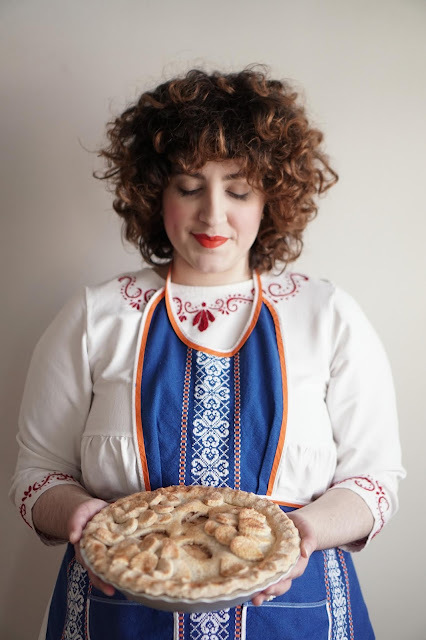 Her style is influenced by traditional folk art and it has an air of whimsy to it - I absolutely adore everything about her and her shop. You can find Olga's stunning instagram account @olga_valeska, and her beautiful website here. 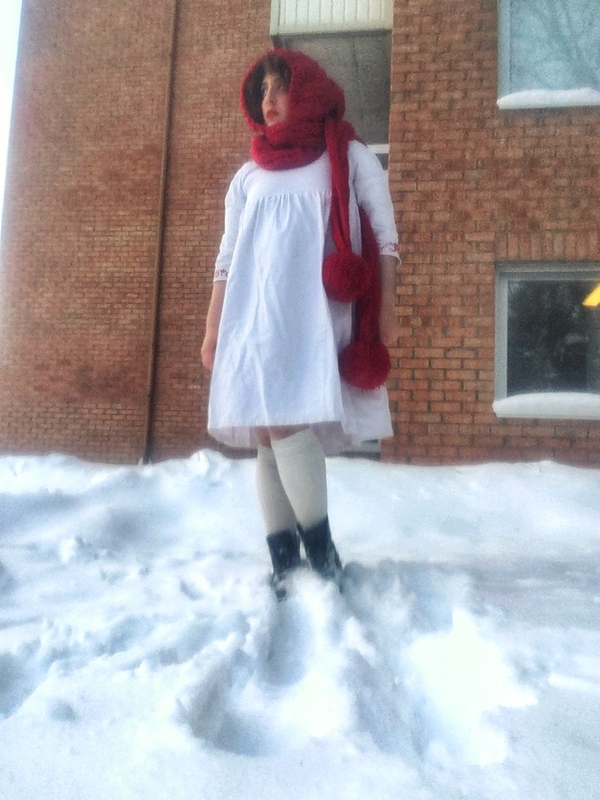 Her Etsy shop has fantastic items, such as fine art prints, post cards, notebooks, home decor and hand made items of clothing, like the dress that I am wearing. I saw this dress on instagram, and immediately thought I had to have it. I was lucky enough to find out it hadn't sold yet. The size of it was just right, on the milimetre, for me. So I instantly bought it. When the package arrived it was like Christmas! Olga had packed it beautifully with love and an incredible eye for details. She had added a number of gifts for me in the package, such as a beautiful wooden hanging decoration and a mini wreath, as well as some postcards that are so beautiful that I want to frame them. Finally getting to the dress - I squealed with joy upon seeing it. It is just as folksy and whimsical as I wanted it to be. The dress is beautifully made with wonderful wooden buttons down the back, and the hand-embroidery is delicate, precise and oh-so-lovely! 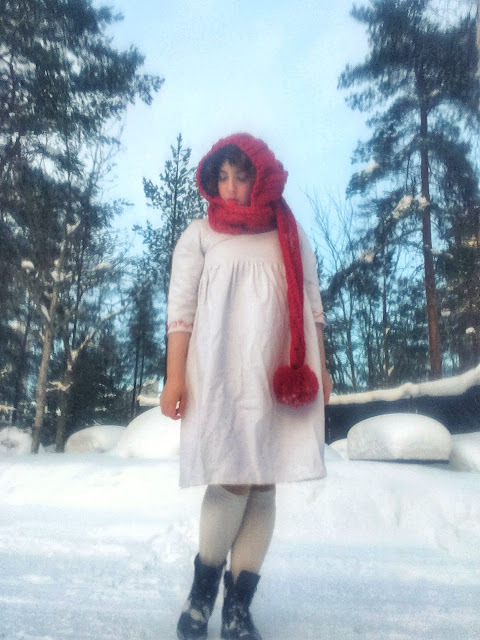 It is a comfortable and stunning dress that made me feel like a snow fairy in it. I adore it! 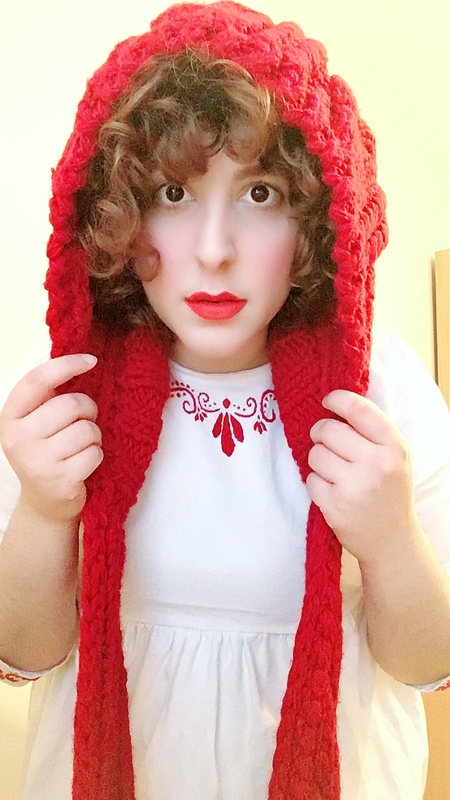 Olga is currently working on more items of clothing and I for one am excited about that! She also has a sale in her shop right now! So please check it out - HERE. The gorgeous inspiration and youtuber Nia the Light (IG: @niathelight) created this beautiful challenge where you're supposed to list the things you are and own it! For a sufferer of depression like myself it's not always easy to express self-appreciation or self-love. This past week has been a really difficult one for me. I've had a really rough time with my OCD and I have been very low. Things have been dark and dreary, hazy and grey. So this challenge was just what I needed. I very rarely compliment myself, and I very rarely have positive thoughts about myself. However, because of this challenge I wrote a list of all the things I think I am. Then I crossed over the negative words. In the video below I decided to omit the negatives and only say the positives and neutrals. It felt surprisingly good to make a video only saying nice things about myself. So I want to pass on this challenge... If you do it, please let me know. And thank you Nia for this incredibly difficult and eye-opening challenge. My name is Mona. Welcome to my blog. You will find an assortment of curls, cakes, pretty dresses and other fun things here. Thank you for visiting!